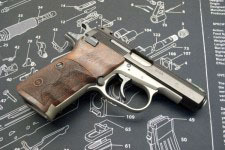 This pistol was completely rebuilt using Cajun Gun Woks trigger parts ,competition hammer and springs. 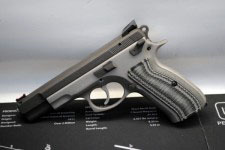 It has new Metrologht night sights and Cz custom shop aggressive textured aluminum grips with 2 Mecgar 19 round mags.It was refinished in Armor black and a custom grey mix cerakote. This was completely rebuilt and upgarded call for details. A complete EFR custom rebuild, call for details. 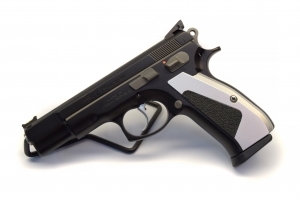 I love the CZ platform and without a doubt the Pre-B was a basic no nonsense combat handgun. Refinished in Graphite Black and Tungsten. 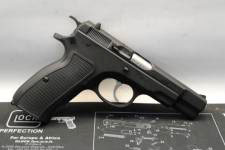 This is a CZ 83 in 32 ACP that was refinished for a lovely young lady ,my wife who has now graduated to one of my custom Tristar P120 9mm. It has minor wear, and my wife has asked me to sell this one so that another lovely young lady might enjoy it. P.S. 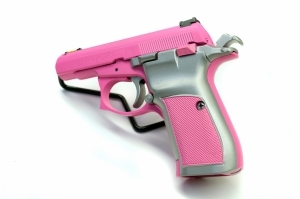 she had me refinish her new pistol to closely resemble this one. It comes with 4 mags. 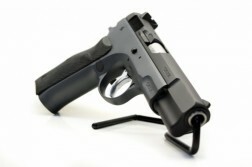 This is a Cz 75 custom compact slide 3.8 inches on a full size grip frame 16 round capicity. 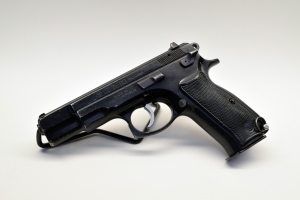 These pistols were made in the 1990's and this is a factory pistol with a matching slide and frame.. It has been totally modernized. It has a tactiacl black rear sight with a fiber opitic front sight. 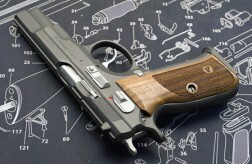 The hammer and trigger system components have all been replaced with a Cajun Gun Works short reset trigger system with a competition hammer and sear system . Clean crisp lightweight single and double action trigger pulls. Outstanding accuracy with a modified beavertail for a higher grip on the frame with nice thin aluminum grips that are not aggressively textured,stays firmly in place in your hand for fast followup shots. 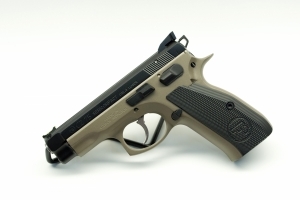 It has been coated in a custom gold cerakote mix with armor black slide and parts. It also features a grip frame that has been modiefied for the modern extended magazine release. It will accept all CZ and Mecgar 16 ,17 18 ,and 19 round mags. The customer wanted a simple two tone look. Opting for an understated armor black on the slide and cobalt on the frame. 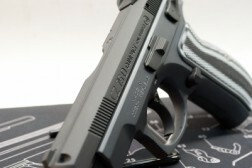 This is another custom CZ-83, We did this one in a two tone silver and grey. 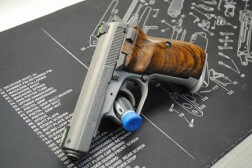 We did this 83 with custom grips from Grips4u.net, and refinished it in sillver cerakote. 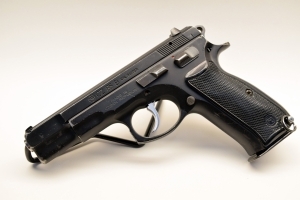 This is an older CZ 85 Pre B with a nice short reset trigger. 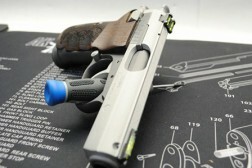 It was refinished in two custom mixed cerakote colors and finished with a nice set of wood grips. This was a very rusty Cz 83 that was in need of some overhaulin. We added a nice 2 tone cerakoted finish using midnight blue and titanium, upgraded the sights and grips and installed a custom one of a kind mag base. 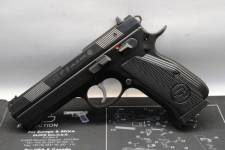 This was a nicely broken in Cz that was refinished and upgraded with a CZ tactical Rear sight with a fiber optic front. A set of VZ grips completed the process. The owner of this one just wanted to refresh the finsh in a flat armor black cerkote. Can't go wrong shooting this classic. I just picked this one up on a whim. 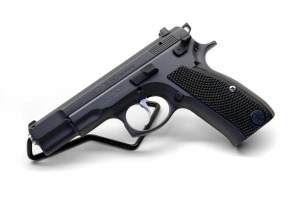 It is an outstanding 45 acp platform and I'm happy with this purchase. It's consistently hitting the 3" shoot & splat targets we have at 7, 10, and 15 yards. I have not yet shot it at 25 yards. Amazing accuracy that has me wondering why I even own any 1911 pistols ( I have 5 of those ). It came with a fiber optic front sight and a factory rear that I blacked out the dots on. I think I need to buy many more mags for this one.